Born in the French countryside, tending sheep in the foothills of the Alps, Br. Polycarp’s roots and temperament were almost opposite those of founder Fr. Andre’ Coindre. Yet God’s plan for Polycarp was to revive this order of Brothers after the death of its founder. He began as a teacher, fervently teaching Christian values and was much beloved by his students. Seeking deeper commitment, he knew of two neighbors who had joined a recently formed congregation of teaching Brothers and approached them about their lives. At age 26 he opted to join them. He was quickly noted for his modesty and serenity of heart. By 1830, the French Revolution revived, along with its persecution of the Church. This was a difficult time for the Order, but it survived and on September 13, 1841, Br. Polycarp was elected by his peers Superior General. He addressed the abuses that had crept into the Community during the difficult times, returning to the ideals of the founder to form a Rule for the Community. At his death there were 400 Brothers serving needy youth in 70 schools, with plans to establish the Congregation in the United States. Rekindling the torch lit by Fr. Coindre, his kindly heart was aflame with love for his Brothers and the youth he served. The Brothers at that time chose as their symbol the joined Sacred Heart of Jesus and the Immaculate Heart of Mary. This image too was representative of the two founders, Andre of Christ’s passion and he with the gentle, suffering heart of Mary. b. 8.21.1801 – d. 1.9.1859. 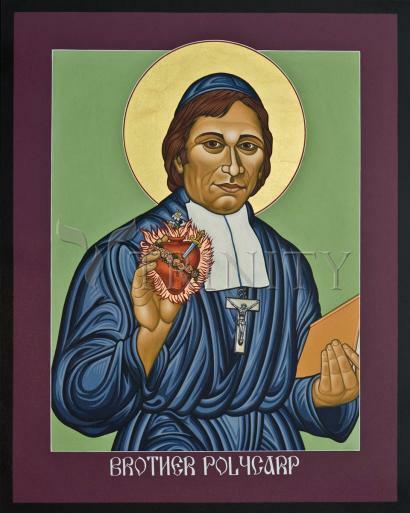 In the preamble to the rule of life, the congregation for institutes of the consecrated life says, “through the faithful observance of this renewed rule, the Brothers of the Sacred Heart might live according to the example of their founder and their first superiors general, in particular the venerable Brother Polycarp, and in so doing, continue to spread in the world the fire of redeeming love whose source is the heart of Christ” and thus Brother Polycarp is indeed set before us as a model. In approving our rule of life the church teaches us that the life of a brother of the sacred heart is a means to union with God and with our brothers in Christ; and in our rule, it does not hesitate to put forward Brother Polycarp as a model for us. The church, we all know, has declared Brother Polycarp venerable and by this decree and relying on its privilege of infallibility, it has declared that Brother Polycarp lived a saintly life and that we cannot err in addressing our prayers to him. By declaring him venerable, the church has given us the certainty that we are an institute grafted on a trunk which has produced the fruit of authentic holiness. This gives us the assurance that our life as Brothers of the Sacred Heart constitutes a path that can lead to holiness, and the proof is that one of our own, Brother Polycarp has been recognized by the church. Brother Polycarp, we are told was a more interior man, more concerned with the spiritual and community life of the brothers. His form of reprimand for example was subtle as it was terse. He usually favored methods and words which were gentle and appealed to the heart, such as, “My dear child, my well-beloved brother, or you know you mean the world to me,” to motivate them to a better attitude.